What is your purpose in life? Build inspirational details into your vision. Be realistic, explicit, and creative. Focus on heroes. Who are three people you admire and respect the most, and why? What are their qualities that you most admire? Be a self-leader. See yourself the way you want to be. What skills and special qualities do you possess that will help make you successful? What are the qualities you would want most to create the perfect you? What can you do right now to act more like the person you wish to be? Life is about continuous learning, discovering new things, and growing. Successful people don't think they know everything. They are open to new ideas. They are always willing to find another way, find a better solution. That's why they're successful. Don't think you know everything and be open to learning and trying new things if you wish to achieve more, grow, create new things, be successful and live the life you want. "I used to say, 'I sure hope things will change.' Then I learned that the only way things are going to change for me is when I change," says Jim Rohn. The best place to start change is with yourself. 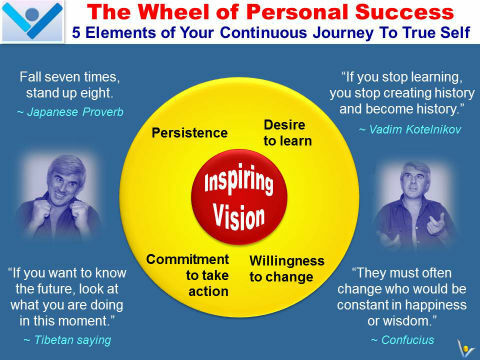 NLP Technology of Achievement suggests the following Four Empowering Beliefs that will help you implement your personal change program: (1) 'I enjoy new ideas'; (2) 'I have an open mind'; (3) 'I know I can change'; and (4) 'I've learnt so much before, and I use every opportunity to learn more‘. Edward Rickenbacker gives you a six-word formula for success: "Think things through – then follow through". Losers are afraid to go after what they want because it would force them to stretch their comfort zones. Successful people aren't free of fear and worry; they move forward in spite of it. They've learnt how to motivate themselves and get themselves to take action. Don’t quit, keep going. Be a winner!. Keep on trying if you wish to accomplish important things. "There is no failure except in no longer trying," said Elbert Hubbard.